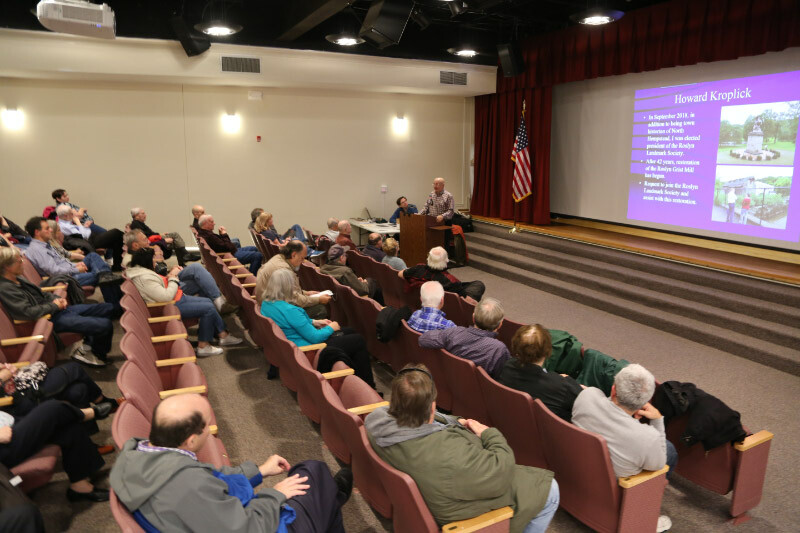 Richard Panchyk, the keynote presenter at Wednesday's meeting of the Long Island Motor Parkway Preservation Society, challenged you to identify another amazing Long Island aerial. Richard revealed the answers at last-night's wonderful meeting. What is the location and orientation of the photographer? East Meadow, looking north over Hempstead Turnpike. What is the complex of buildings in the aerial? What is in the location now? Meadowbrook Hospital, now Nassau University Medical Center (NUMC). What is the golf course shown here? What is it known as today? Salisbury Links, now Eisenhower Park Golf Course. 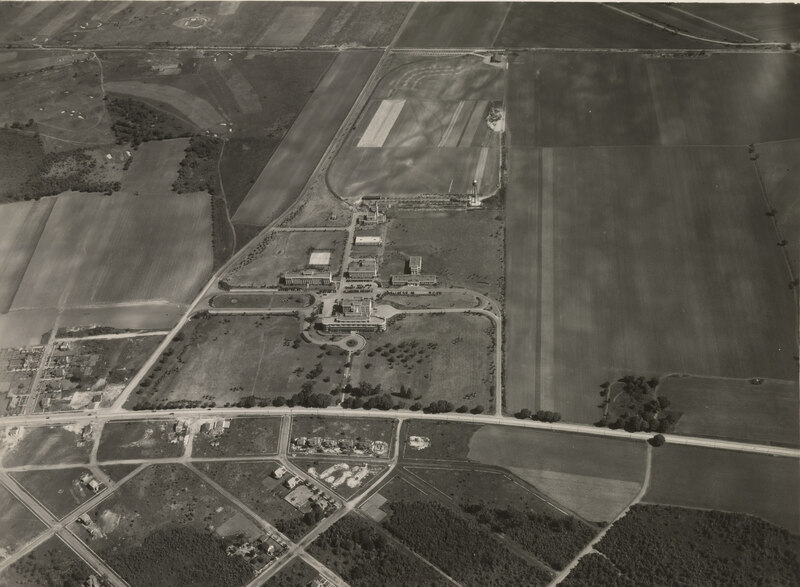 What was built on the farmland below the golf course? My alma mater East Meadow High School built later in 1953..
Two-lane Hempstead Turnpike, across the bottom. Carman Avenue vertical, across the left. Long Island Motor Parkway and Westbury Road, top right corner. Identify the Motor Parkway and its structure(s). The Motor Parkway can be seen below Westbury Road in the top right corner. The structure is the Westbury Road Motor Parkway Bridge. The other bridge seen on Carman Avenue is the bridge over the Central RR line. What is the approximate date? Provide a rationale. 1939. Rationale: Meadowbrook Hospital was built in 1935. No housing developments or Nassau County Jail. Congrats to George Philippides, Greg O., Art Kleiner, felow East Meadower John Van Gasteren, Tim Ivers, Michael LaBarbera, Frank Femenias, Brian McCarthy and Frank Mendyk for identifying Wast Meadow and Meadowbrook Hospital. Kudos to Greg O., Michael LaBarbera, Frank Femenias,Brain McCarthy and Frank Mendyk for recognizing the Motor Parkway and Westbury Road in the top right corner of the aerial. I got it wrong! 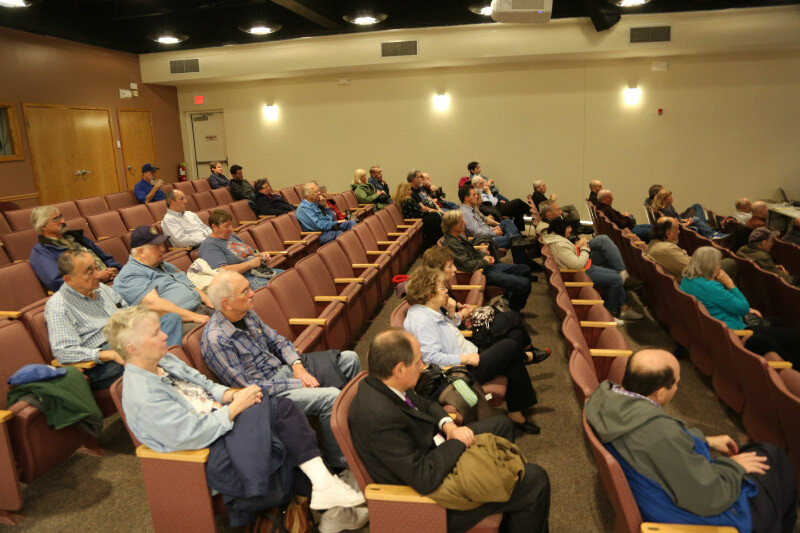 55 people turned out to the fall meeting of the Long Island Motor Parkway Preservation Society. 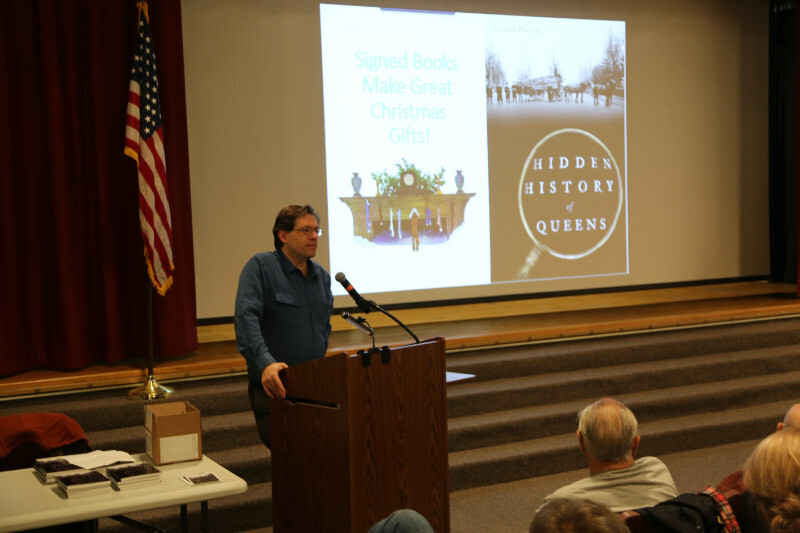 Author and historian Richard Panchyk presented inights into the :Hidden History of Queens". 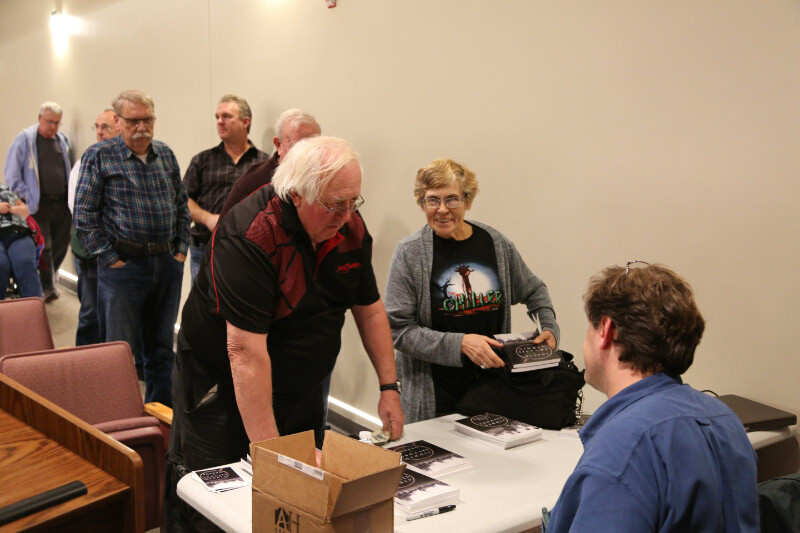 There was a long line for Richard's recent book Hidden History of Queens. 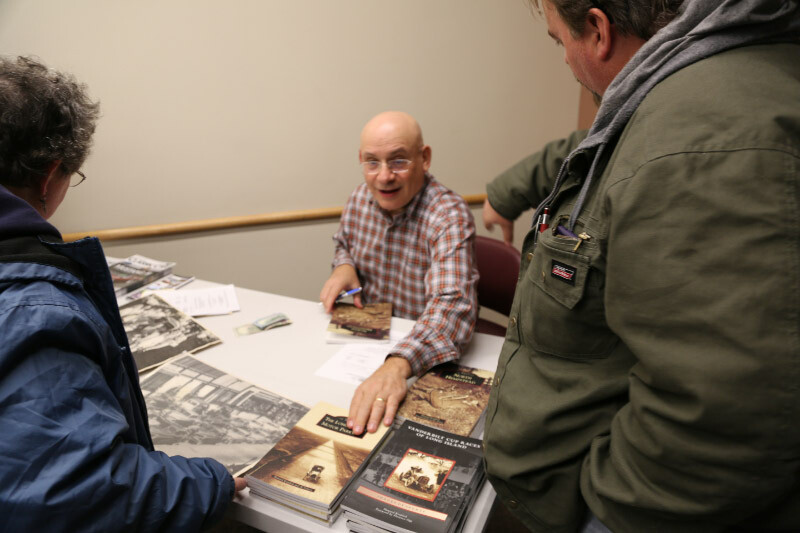 Over $500 was also raised for the Roslyn Landmark Society including registration of 15 new members. 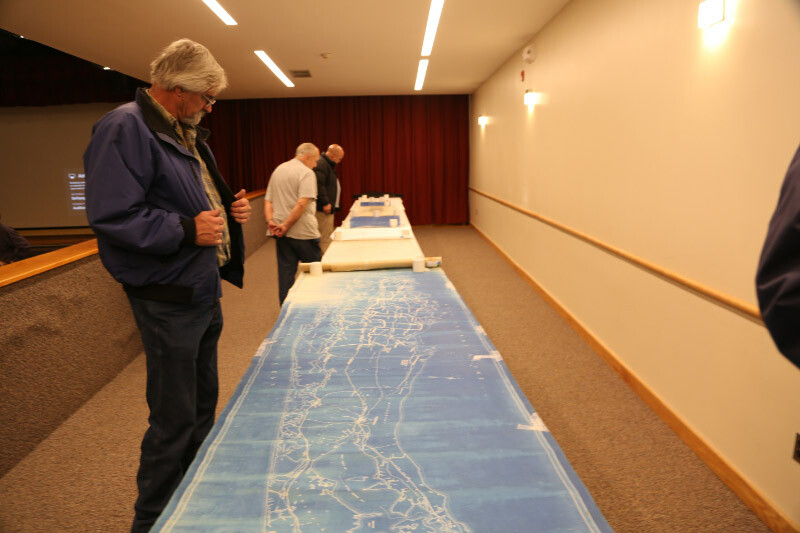 Several Motor Parkway surveys and blueprints were on display. The Long Island Motor Parkway and the Westbury Road Motor Parkway Bridge. The Carman Avenue Bridge over the Central RR. This farmland was the future location of my alma mater East Meadow High School. Looking north in East Meadow over Hempstead Turnpike. The building complex was Meadowbrook HOspital which is now Nassau University Medical Center. The golf course was Salisbury Golf Course, now part of Eisenhower Park. East Meadow High School was built below the golf course. Major roads are Hempstead Turnpike across the bottom, LIMP across the top, Carman Avenue vertical on the left. LIMP structures include Carman Avenue bridge, upper left. The date must be some time between 1935 when Meadowbrook Hospital was built and the late 1940s when additional buildings were added to the hospital complex. -What is the location and orientation of the photographer? -What is the complex of buildings in the aerial? What is in the location now? -What is the golf course shown here? What is it known as today? -What was built on the farmland below the golf course? Hempstead Turnpike across the bottom. Carman Avenue on the left. Old Westbury Rd. -Identify the Motor Parkway and its structure(s). 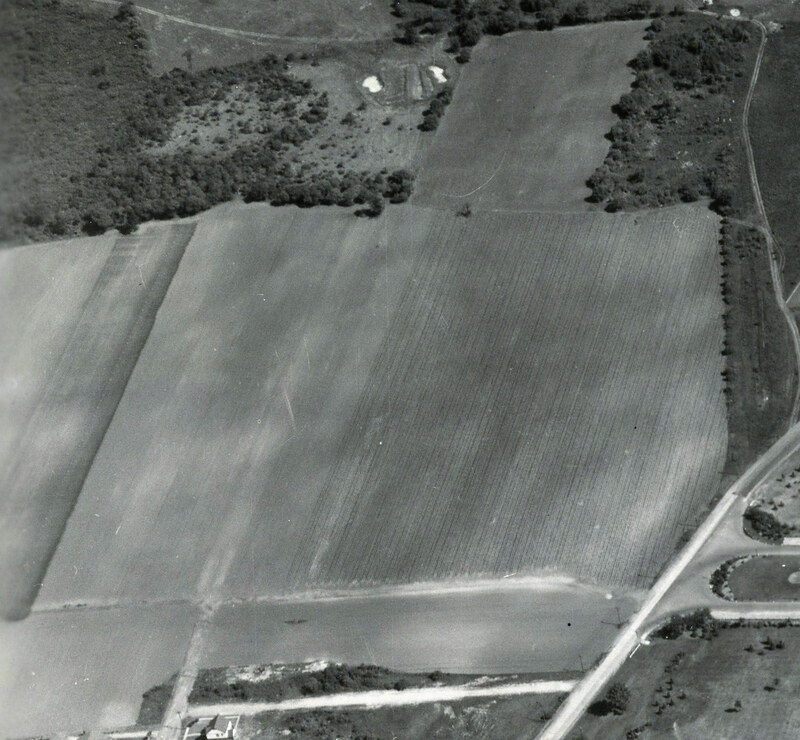 The Westbury Road (Old Westbury Road) Bridge can be seen in the top right corner of the aerial. -What is the approximate date? Provide a rationale. Hospital built in 1935 but not yet expanded in the 40’s and 50’s, lack of many homes built in the 1940’s, I’ll guess this is sometime in the late 1930’s. Motor Parkway is at the top of the picture running left to right. The photographer was flying almost directly over my house (which would not be built until 1952) in East Meadow facing north/north-east. The building complex is the old Meadowbrook Hospital which today is the site of Nassau University Medical Center. The golf course was formerly known as Salisbury but is now Eisenhower Park. East Meadow High School, my and Howard’s alma mater, was built on the farmland below the golf course. The major roads are the Motor Parkway which runs horizontally across the top, Hempstead Turnpike is the horizontal road near the bottom, and Carman Avenue runs up between those two roads from lower left to the top center of the picture. The Carman Avenue bridge over the Motor Parkway can be seen. Meadowbrook Hospital was built in 1935 and a 1952 photo of the hospital shows many additional buildings so the photo date must be between those two years. The high school was built in 1953. From the sparseness of buildings in the photo I’m going to guess it was taken not too long after the hospital was built. Correction, Howard. Photo direction is north/north-west. 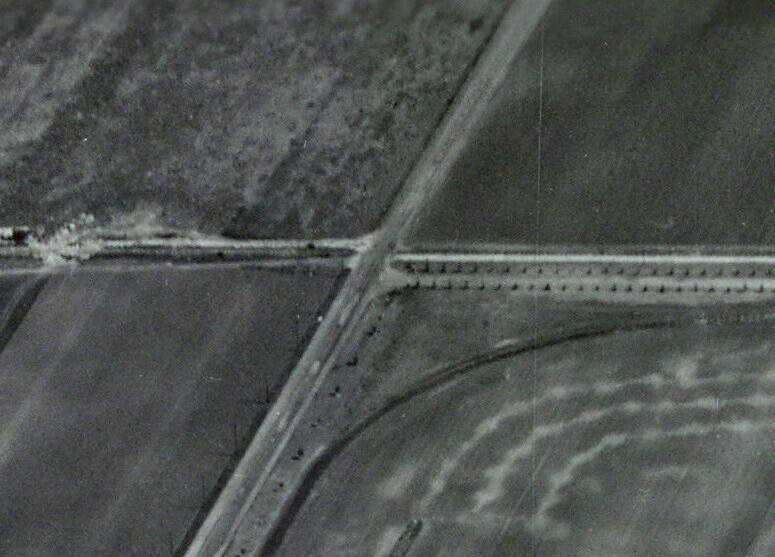 Looks like Meadowbrook Hospital looking north in 1935 with the Salisbury Links on the left (current Eisenhower Park) and the Carman Avenue bridge top left over the LIMP. East Meadow looking north from Hempstead Tpk at NUMC Hospital’s original bldgs behind todays big tower. The golf course was the Salisbury Links (now Eisenhower Park). The Farmland below the golf course is the future site of the East meadow High School west of Carman Avenue and East of Carman Ave would be the Nassau Country Jail. Major roads east west are Hempstead Tpk at the bottom, Carman Avenue north and south middle of picture and the Central Ave RR train above in the picture east and west. Motor Parkway bridge is in top right of picture going over Westbury Avenue. Where Salisbury Park Drive would be today. 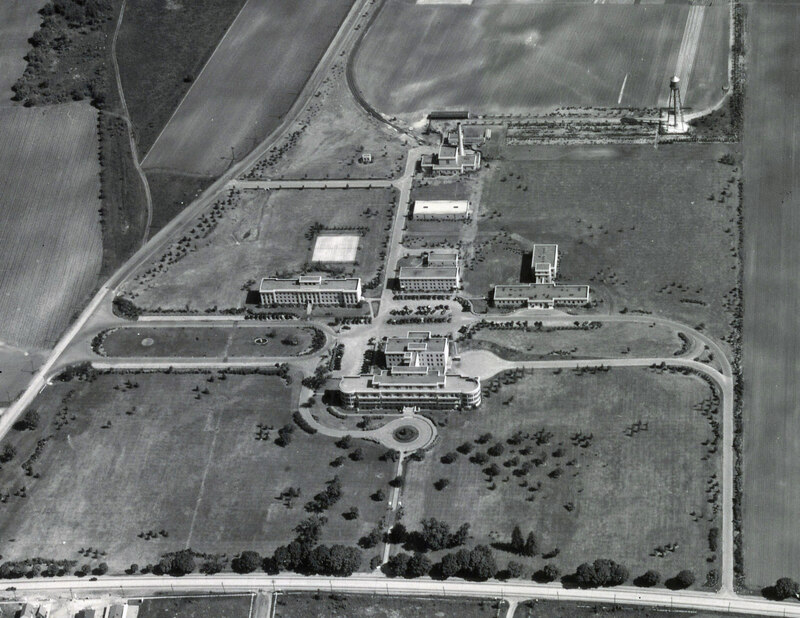 The hospital was built 1935 and the housing boom began 1947 so i would date the picture around 1946 since many buildings on the campus are established yet no homes and few stores built up around it. East Meadow looking N. Meadowbrook Hospital, now Nassau County Medical Center, Salisbury Golf, now Eisenhower Golf, East Meadow High School, Hemp Tpke, Carman Av, Central RR, (Salisbury Park Dr, Motor Pkwy top right corner), Westbury Ave parkway bridge still standing, photo date before 1950’s when the bridge was removed. Hoping to see Richard tonight. *Location/Orientation: Birds Eye View of East Meadow, NY facing north. *Building Complex, Then & Now: Meadowbrook Hospital then, Nassau County University Medical Center now. 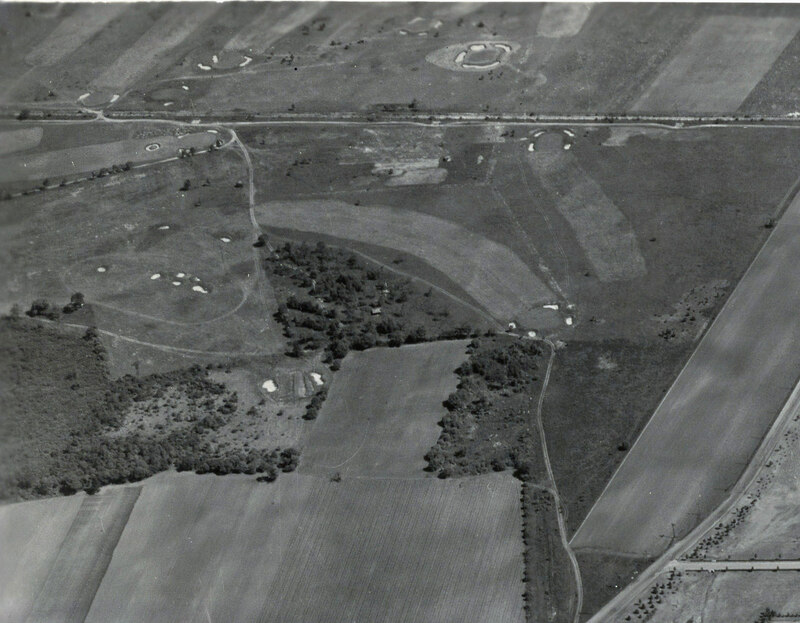 *Golf Course, Then & Now: Salisbury Links then, Eisenhower Park now. *Presently S/O the Golf Course: East Meadow High School. *ID Major Rds: Westbury Rd, LIMP ( Westbury Rd Pkwy Bridge ), Central RR ROW, Carman Ave, Hempstead Tpke. *ID LIMP/Structure: LIMP is at upper right corner bridging over Westbury Rd. Then continues west under Carman Ave Hwy Bridge ( not in view ). 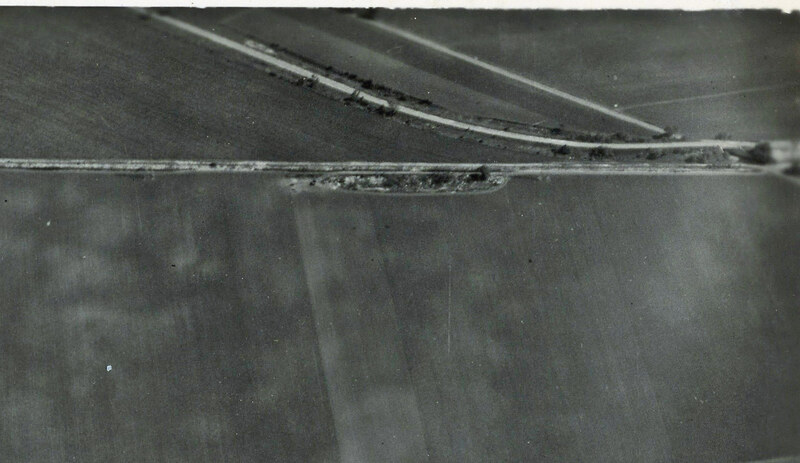 *Year: Westbury Rd Pkwy Bridge was still intact 1955. So I’ll say early 1950"s.
county buildings, morgue NC jail etc.